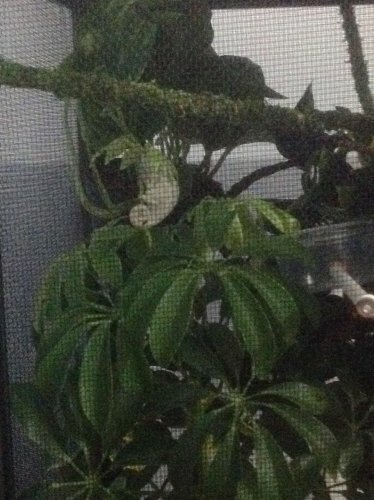 Does your chameleon turn white when it sleeps? Pajama colors. They go super pale when sleeping When they are babies they are mostly the same pale green color all over. LOL I like their pajamas too! yes every night. so sweet. looks like a tiny baby. Yes, Godrick is a good boy and changes into his jammies at bedtime too. I LOVE it when my little Max puts on his white jammies for bed, so adorable. Mine always shows more color when sleeping. I guess it can vary between breed/temperament? Cute pic! 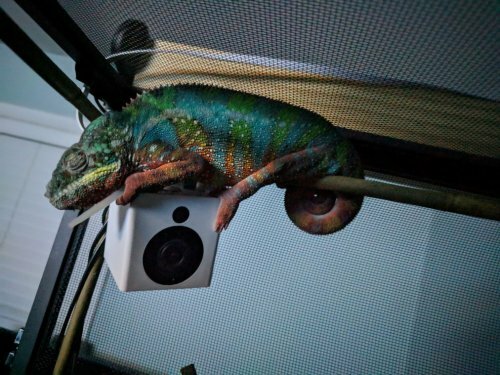 Is he sleeping on one of those pet cameras? 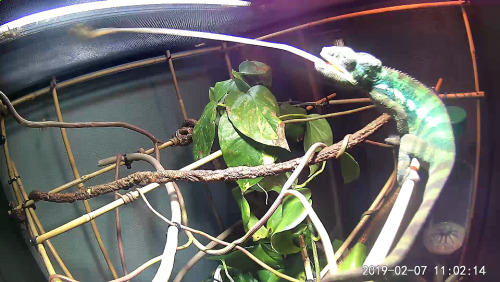 Yeah, it's the cham cam! That is really cool. Does it work when the lights go out too? It does, it has a night vision mode that can turn on automatically when dark. But I have that turned off because I'm not sure if he can sense this or not so to avoid stressing him out its always off. I can turn it on remotely through the app. Here's a snapshot. You can watch live video, go back in time, snap pictures. Not bad for $20. Omg I want one!!!!!!! Lol where did you get it? And it’s called the Cham cam right! Thank you Ryan! It has a good quality pic too! Your guy is awfully cute too. Heres Zillas first night when we got him, completely white. Trying to hide in his umbrella plant. That was like a seek and find mission with that pic. I was like where where lol.